Cup Characteristics: Buttery with a hint of vanilla. Envision the aromas of fresh caramel cooking on a stovetop. Perfect with a little milk and a dash of sugar. A great winter tea. Caramel owes much of its legacy to the famous chocolatier Milton Hershey. Before branching into chocolate, Milton brought a confection normally made by grandmothers using butter, vanilla, and sugar to national attention. He formed the Lancaster Caramel Company and then sold it in 1900 for the whopping sum of 1million dollars thus creating the American Caramel Company. That company – if you can believe it – even had its own banknotes printed? But enough about that. The taste of caramel is what is truly amazing. Crème caramel…caramel popcorn…caramel ice-cream…caramel cubes…caramel apples… Any way you look at it caramel is delicious. 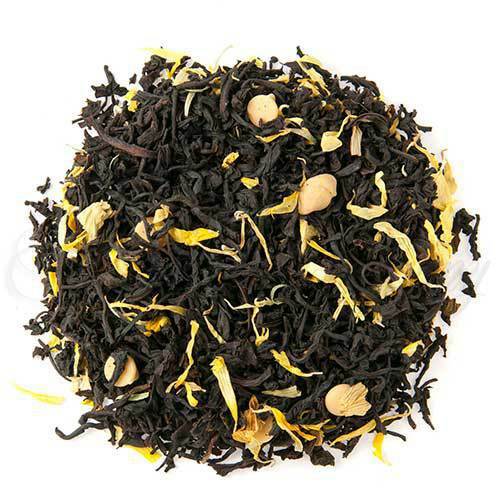 Its sweet butteriness makes this tea one of the great dessert teas. The slight vanilla notes of the blend mix perfectly with a little milk and a dash of sugar. This tea, true to form, tastes like a million bucks. I really enjoy the flavors in this black tea. I am a Cream and Sugar tea drinker. With this tea, I was very pleased with half my normal sugar and creme added. Even before the addition of these, the flavor profile was balanced and smooth. But, after, I was in heaven. This is now my favorite Tea tea, (black, green or otherwise) and still ranking higher than some of the Rooibos blends. This will likely become my new Caffeinated go to when I’m not after a solid black tea experience.